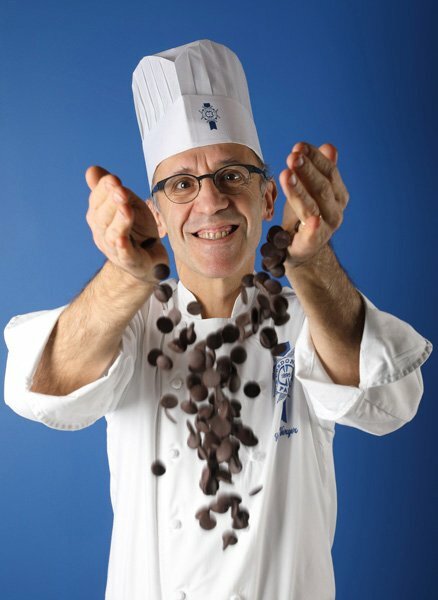 Born in Angoulême, Chef Éric Verger has a “CAP (Certificat d’Aptitude Professionnelle)” and a “Brevet de Maîtrise” in pastry. Chef Verger worked as pastry “second” at the two Michelin-starred Relais de Bracieux. A year later, he decided to open his own pastry shop and bakery in the Sarthe region of France. He was in charge of the company for 6 years before being recruited as a pastry Chef by Pène, which specializes in making entremets, chocolates and small cakes. In 1998, Chef Verger was appointed Head of the M. Willems pastry lab, a catering company in the Île-de-France. He went on to work as “second” in pastry at L’Écureuil pastry shop in Paris’ 17th district. He then moved on to become pastry Chef at Mothu, in Saint-Mandé, where he remained for 3 years before entering the world of education. Chef Verger taught pastry at Albert de Mun, a private hospitality college in Paris’s 7th district, for 3 years. He spent one year in research and development in the pastry field, working for the Salé/Sucré company in Champigny-sur-Marne. He then worked as a pastry Chef for 2 years in a high-end catering company, Kaspia receptions. Chef Verger joined Le Cordon Bleu Paris team of Chef Instructors in September 2016.